A new 32-unit luxury residential community, Roystonia Mews, is to be bulit at Piarco. 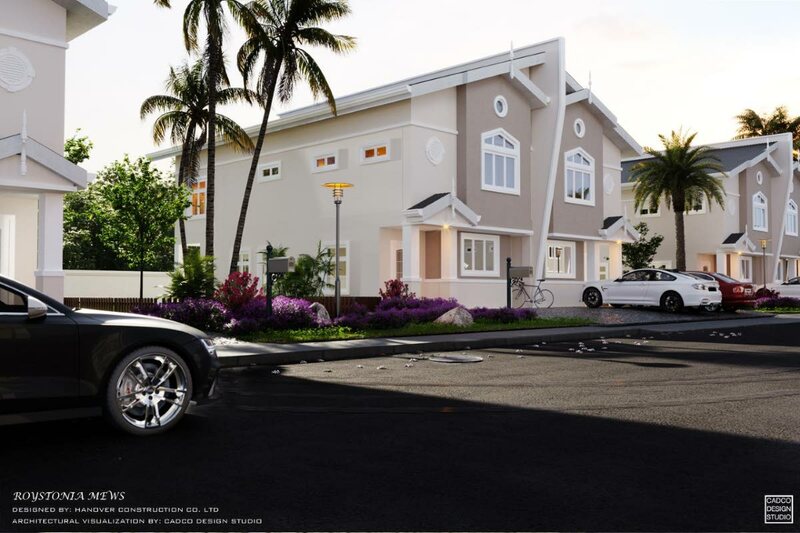 The crisp, elegant facades of houses in white, cream and beige stood out in renderings for Roystonia Mews, a new 32-unit duplex luxury residential community now being built in Piarco, to be completed by April 2020. 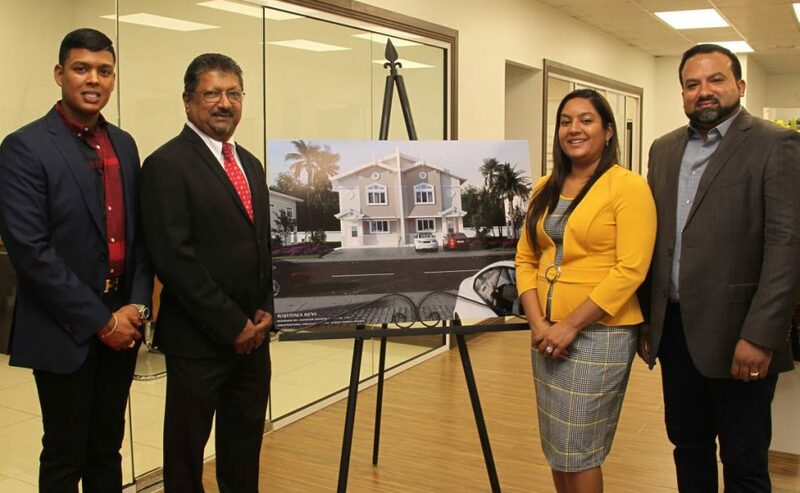 The launch for the new development took place on Friday night at the offices of Hanover Construction Limited on Pasea Street, off Carmody Road, St Augustine. Hanover Construction is the contractor building the homes, while Home Mortgage Bank is providing project financing. Hanover Construction Ltd managing director Krishna Boodhai. Hanover Construction specialises in design and construction of residential and commercial buildings, land development and related infrastructure works. The company is owned and chaired by businessman and entrepreneur Anand Persad, who was out of the country for the launch but was represented by executive director and corporate secretary Kavita Persad-Maharaj, assistant corporate secretary Vasisth Persad, director Richard Maharaj, and other senior management of Hanover Construction. “One of the affiliated companies of Hanover owns the land (at Piarco); we got project financing from Home Mortgage Bank; we are marketing; and we have a number of financial institutions and real estate agents who will link up with us, so we are selling to third parties, and the real estate agents and bankers are here this evening to deal with prospective buyers,” Boodhai said. Roystonia Mews is designed to feature 32 luxury duplex units. “We are pleased to say that already nine of the units are sold or committed as of today.” Each unit costs $2.2 million and comprises 1,850 sq ft, all designed as end units. “Every unit has its own green space at the back, and eight feet on the side, so between two buildings there’s eight plus eight, so 16 feet which will be kept green with a very low separating fence, and landscaped,” Boodhai said. “At the eastern end of the project, which is about 40 feet wide by the side of the road, there is green space with the potential for a pool, clubhouse and common entertainment centre,” he said. Start-up fees to maintain shared spaces will be $600 a month, which does not include 24-hour security. When all units are sold, homeowners will decide on those issues, Boodhai said. A management company for the Piarco Roystonia Mews has already been formed, which will be turned over to homeowners to run their own operations. 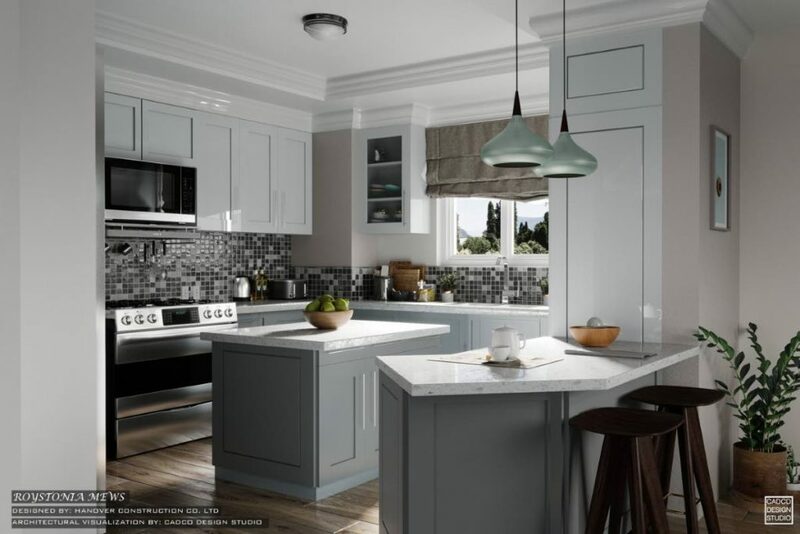 The proposed kitchen of units at the luxury Roystonia Mews residential community. 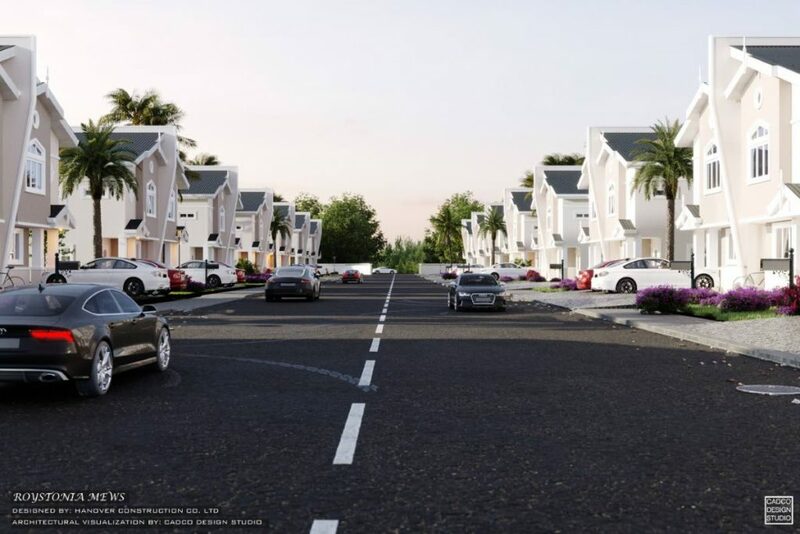 Following on from that project, Hanover Construction received a large contract to build 936 suburban housing units at Trestrail Lands, D’Abadie, a mix of single family, townhouse and apartment units. One phase of that project was completed late last year, the completion of 100 units. Prime Minister Dr Keith Rowley and representatives of the HDC and the Ministry of Housing and Development gave 82 families keys to new homes in a handover ceremony on September 26, 2018. “We are still very active on that project and we are currently building three-bedroom townhouses,” Boodhai said. 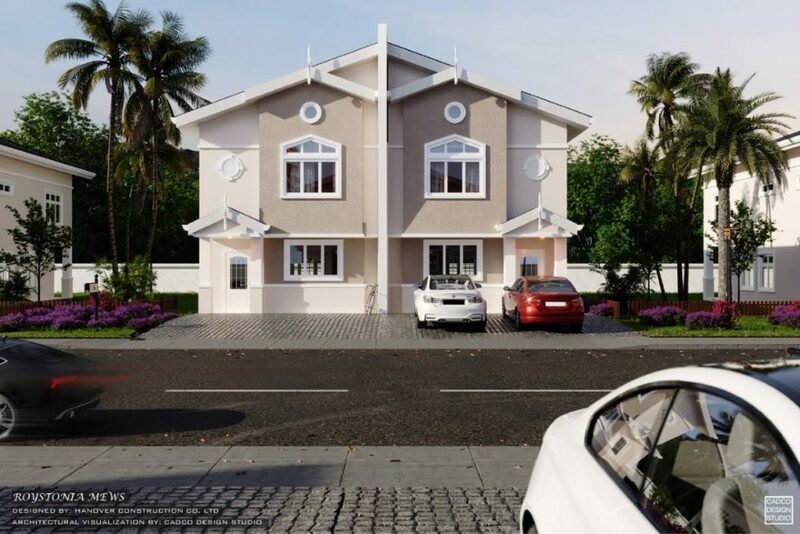 An artist's impression of the duplex units at Roystonia Mews, Piarco, which are scheduled to be completed in 2020. 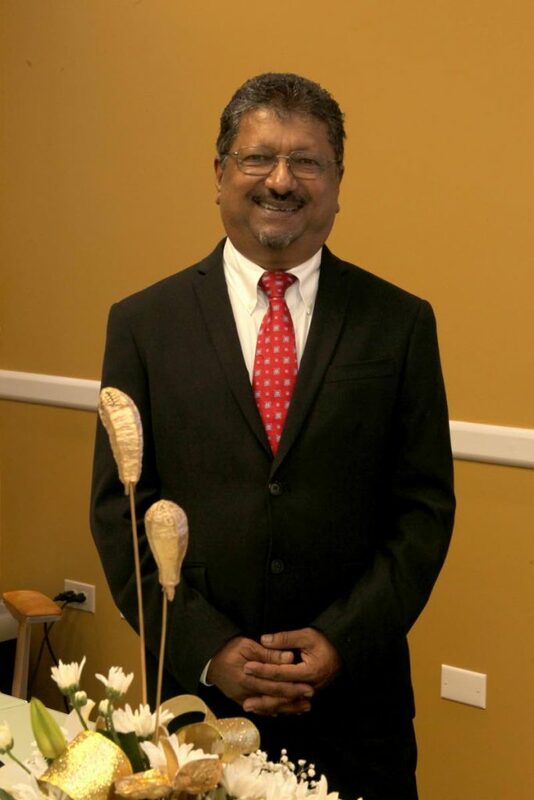 He said the efforts to make the duplex houses of Roystonia Mews a well-thought-out project meant consulting with many architects, engineers, interior designers and engineers. One typical drawback of row houses is the lack of windows along some walls: so every unit is this development is designed like an end unit, with every bedroom and bathroom getting a window, and every unit-holder getting a wraparound grass area. Reply to "Roystonia Mews million-dollar luxury homes in Piarco"